ER signaling pathways in vascular ECs. ERs are ligand-activated transcription factors that translocate to the nucleus upon estrogen binding and regulate gene expression. Classically, the hormone-bound receptor dimerizes and binds to specific DNA sequences called estrogen response elements (ERE), displacing corepressors (CoR) from the DNA, recruiting coactivator (CoA) proteins, and activating gene expression. ERs can also be transcriptionally activated via ligand-independent pathways in which growth factor receptor (GFR) activation leads to activation of specific kinases that directly phosphorylate the ER, again leading to altered gene expression, either directly by the ER or via ER interactions with other transcription factors (TFs). In the current issue of the JCI, Chambliss and colleagues demonstrate the in vivo importance of a long-recognized third signaling pathway mediated by non-nuclear ERs in ECs (6). 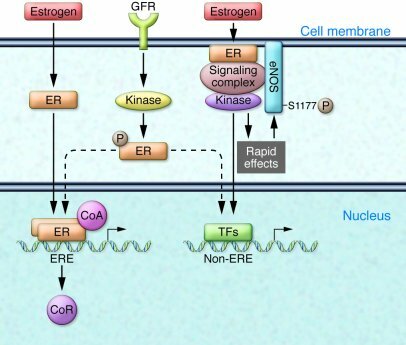 In this pathway, estrogen induces a subpopulation of cell membrane–associated ERs to form a signaling complex that results in rapid activation of specific kinases, which in turn phosphorylate and enzymatically activate eNOS.